With the insane number of vaporizer brands on the market today, it can be difficult to discern which one is going to have the best vaporizers for you. Check out the information found below on some of the most popular and well-loved vaporizer brands that are available today. 7t Floor Vaporizers is a brand that offers some of the most famous vaporizers around. The Silver Surfer vaporizer, for instance, is one of the most popular desktop vaporizers to ever be created and has one of the largest followings. Their portable vaporizer, the SideKick, also has a huge following as the ones used to their Silver Surfer were happy to test out their new portable option and fell in love with it. This portable vaporizer allows you to vape both dry herbs and concentrates in one unit, which was revolutionary for the time. 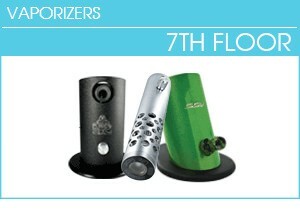 7th Floor Vaporizers also has other renowned desktop vaporizers, such as the Super Surfer vaporizer, an upgraded counterpart to the Silver Surfer. This vaporizer features a number of improvements upon the well-loved original, including digitization of the temperature control. Da Buddha Vaporizer is another fan favorite and is also a desktop vaporizer. All of these are dry herb only. There is another "portable" vaporizer that this brand sells, although it is more of a handheld device than it is a portable vaporizer, it gives you the power to pass it around the room. It connects to a cord unlike a portable vaporizer, making it easy to maintain the power of each one without the need for a battery. It is much larger than a standard portable vaporizer so it is not ideal for trying to take it with you on the go, but it is ideal for those who like to have sessions with a lot of people in a low key home environment or even at a party. These vaporizers are higher end, so no matter which one from this company you intend to vape with, you can expect to pay a price point of anywhere between $179 and $499 for your product. Atmos RX is a brand that is designed for anyone of legal smoking age to enjoy their herbs. It is a company that makes a unique variety of different vaporizers for you to choose from depending on your specific needs. They pride themselves not only on the unique portable vaporizers that they make, but they also pride themselves on their customer service team, dedicated to giving their customers only the best when it comes to vaping. Atmos RX puts attention to detail at the forefront of everything they do. They aim to design top of the line vaporizers that stray far away from what they consider to be bulky and unpractical desktop vaporizers to provide their users with the portable experience that they want. With cutting-edge technology and constant innovation, Atmos RX keeps their eyes on the trends of today while also keeping up with the trends of tomorrow to create vaporizer pens that outshine anyone's expectations of a portable unit. Atmos RX offers a large variety of vaporizers, each one designed to fit a different set of needs among their customers. Some of them are designed specifically to be used with dry herbs, such as the Atmos Jump, the Atmos RX original, the Atmos RX Jr and the Atmos RX Boss. Others are designed to be used exclusively with wax. Among these are the Atmos Q3, the Atmos Tyga x Shine Kiln RA, the Atmos RX Kiln and the Atmos RX Magna. Even more can be used with both dry herbs and waxes and oil concentrates. These include the Atmos RX Vicod 5G 2nd Generation, the Atmos RX Thermo SW, and the Atmos RX Tyga x Shine Pillar. Whatever it is that you need from a portable vaporizer, you are likely to find it by shopping through Atmos RX. Arizer vaporizers are known for their simplicity of use. These vapes are made for those who want something sophisticated yet casual, a vaporizer that they can be proud to own and show off to their friends. They understand the needs of their customers are changing almost every day, and it is for this reason they do not only make one type of vaporizer, portable or desktop, but instead make several different instances of both. This helps their customers to find what they need within the company at an affordable price point that cannot be beat. Arizer vaporizers come in many shapes and sizes, but all of their vaporizers are for use with dry herbs only. Instead of focusing on vapes that can do both, they put all of their focus into optimizing the dry herb vaping experience for the classic user. They offer desktop vaporizers with powerful heating elements designed to bring their users a one of a kind experience with every vape session. Desktop vaporizers offered by Arizer vaporizers include the Arizer V Towe and the Arizer Extreme Q. Both of these Arizer desktop vaporizers are made with temperature control that is digital and simple to use so you won't have to fiddle with analog controls to get the job done. Their portable Arizer vaporizers consist of the Arizer Air, the Arizer Air II, the Arizer Solo and the Arizer Solo II. All of these vaporizers are made for taking with you on the go and offer sleek, easy-to-use designs that are discreet and comfortable. While they are a bit bigger than some other dry herb vaporizers, portable Arizer vaporizers deliver all of the power that you have come to expect from their portable designs in the form of a smaller unit. DaVinci is a brand that is dedicated to providing high-end portable vaporizers. DaVinci vaporizers offer you all of the power and refined design that you have come to expect from a desktop vaporizer with none of the bulk and all of the portability. These vaporizers are known for being sophisticated both in looks and in functionality. They use highly advanced engineering and software that turns them into powerful little vaporizers that you can optimize to fit each of your needs. There are three different models DaVinci vaporizers currently offer. Their first vaporizer, the DaVinci, was one of the first ever to offer precise temperature control on a portable vaporizer, making it a groundbreaking invention. Its sleek portable design was one that changed things up as well, offering an ergonomic fit in the hand, which made it excellent for carrying to and fro. Then came the DaVinci Ascent. This line of DaVinci vaporizers came with an all glass vapor path that optimized the flavor of the herbs, making this vaporizer one of the best for those who value the flavor and aroma of their materials. The DaVinci IQ is perhaps their sleekest yet. It is an easier to use, high tech and sophisticated-looking vaporizer that has smart technology and produces unmatched vapor quality. All of these vaporizers are created to appease the needs of different users. The DaVinci IQ is to be used only with dry herb material, while the DaVinci original vaporizer and the DaVinci Ascent are to be used with either dry herbs or wax depending on your mood that day. The price is right for both the dry herb vaporizer and the two vaporizers that offer dual modes, making DaVinci vaporizers a solid choice for the budget conscious that still wants to get the most out of their vaping experiences. Dr. Dabber Vaporizers is a brand that is commited to providing high quality vapes to those who value their vaping experiences. These vaporizers are made to invite portable vaporizers into the market, ones that are reliable and convenient yet every bit as potent and as efficient as a larger option. Sleek, slender and to the point, these Dr. Dabber Vaporizers are compact and discreet units that allow you to vape anytime, anywhere with total discretion. They offer bigger rigs as well, ones that will allow you to vape your wax from the comfort of your own home. These come in the form of different attachments that you can add on to a lot of the wax vaporizers. 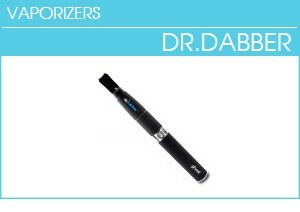 Dr. Dabber Vaporizers offers a wide variety of vaporizers for their users to choose from. These include the Dr. Dabber Boost, Dr. Dabber e-Rig, Dr. Dabber Aurora, Dr. Dabber Ghost and the Dr. Dabber Light. Dr. Dabber Vaporizers not only specialize in bringing a world of vaporizers to the market; it also provides its users with a number of different attachments that are designed to make their products even more enjoyable. These attachments are designed to help make the experience more smooth and cool so that your experience with your concentrates is better optimized and more enjoyable than ever before. These attachments include the Dr. Dabber Boost Mini Ball Glass Attachment; the Dr. Dabber Boost Glass Recycler Attachment; the Dr. Dabber Mini-Banger Glass Rig; the Dr. Dabber Aurora Globe Attachment; the Dr. Dabber Ghost Globe Attachment; the Dr. Dabber Boost E-Rig Mod Attachment; Dr. Dabber Boost Heating Element and Custom Recycler Kit; a Dr. Dabber Boost Heating Element; Dr. Dabber Custom Boost Glass Recycler Attachment; Dr. Dabber Large HoneyRig and a number of other smaller accessories like a honey mat and shatterproof ball. 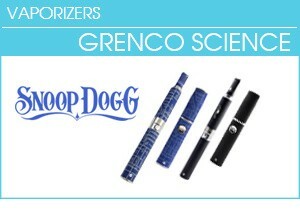 Grenco Science is a leader in portable vaporizers. They specialize in bringing their customers everything that they want from a vaporizer, including the ability to vape any kind of material, whether it is oil, wax, or dry herbs. This company often produces vape pen style vaporizers but also has standard portable vaporizers as well so that you can use the one you are most comfortable with. These vape pens are simple to use, with controls that make the vaporizers ideal for swift changing while on the go. They are ultra portable and ideal for those who want to go on hikes thanks to their durable nature. Grenco Science vaporizers also produce incredible vapor, making them the ideal choice for those who want to truly experience every hit that they take. The temperatures are usually customizable and simple to control when you are out and about, making it so you don't have to fiddle around with your vaporizer when you just want to vape. They design vaporizers, such as G Pen, that are not only simple to use but are stealthy as well, so if you want to vape in a more populated area, you are more likely to be able to do so. You can enjoy the power that comes with each of their vapes, no matter which one you choose. Vaporizres from Grenco Science include G Slim Ground Material Vaporizer; G Slim Concentrate Vaporizer; Grenco Science G Slim Vaporizer - Pizzanista Edition; G Pen Ground Material Vaporizer; G Slim Hookah Vaporizer; G Pro Vaporizer; G Pen Elite Vaporizer; G Pen microG Original Vaporizer (Dual Set); G Pen Vaporizer; G Pen microG Vaporizer; G Pen Pro Vaporizer; Grenco Science G-Pen Elite Vaporizer - Badwood Edition; and the Grenco Science G-Pen Elite Vaporizer - Phil Frost x Burton. Magic Flight was one of the first-ever portable vaporizer companies to make a name for itself. Their first launch was the Magic Flight Launch box, a vaporizer made out of wood. This iconic vaporizer is still around today and has not once lost its popularity, still hitting the top of the charts with vapers of all ages and levels of experience. Now, they have incorporated a number of different kinds of vaporizers into their lineup, each one better than the next, without sacrificing the quality that people love about the Magic Flight vaporizer line. As of now, the Magic Flight vaporizer brand is something that has never gone out of style. They offer three different kinds of vaporizers, one of them being the very first launch box that they ever put out onto the market. This vaporizer is the Magic Flight Launch Box and uses a trench, as they call it, instead of a chamber like most other vaporizers do. Giving an update to the classic Launch Box from Magic Flight vaporizers came the Magic Flight Muad-Dib vaporizer. This vaporizer features a few upgrades on it, taking the Launch box to the next level. It is still made out of wood, but this option offers a unique brass plating on the front that frames its glass window. Both of these Magic Flight vaporizers are made with wood, and the first Launch Box was made for dry herbs. The Muad-Dib and the most recent addition to the lineup, the Magic Flight JaK D'Rippa E-nail, allow for use with wax. One of the most coveted vaporizers in the land, Magic Flight vaporizers are truly treasured pieces that most people want to own at least one time in their lives. The reputation of Magic Flight continues to serve them well. Vapir has been around for quite some time now, born out of a passion to bring the best of the best in terms of digital and portable vaporizers. When they first emerged, there were not many portable vaporizers to be found on the market, making them one of the first to bring such an idea to life. This company sought to change the way that people vaped, and they certainly achieved that. Always staying on top of the newest technology and the most important trends, Vapir vaporizers combine a sophisticated look with unique designs that are hard to find anywhere else. They all use convection heating, meaning that you will never have to worry about the vapor of these vaporizers being harsh from accidental combustion of the material. This technology also provides you with some of the smoothest, most flavorful, decadent hits you will likely ever experience. Building on nearly years of experience and expertise, Vapir vaporizers continue to produce some of the smartest and most effective vaporizers today. 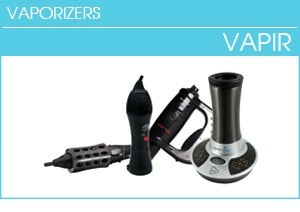 Vapir vaporizers include a wide variety of options. They have a vaporizer designated for strict use with dry herbs, which is the Vapir NO2 Vaporizer, a portable vaporizer with a unique and ergonomic shape. They also have a portable vaporizer that is designed solely for use with wax instead of herbs; this is the Vapir Pen Vaporizer. It is discreet and looks like a vape pen for on the go vaping. Then came the Vapir Rise vaporizer, a desktop vaporizer that allows you to vape both dry herbs and wax all the same. Finally, Vapir vaporizers offers the Vapir Prima vaporizer, one that is a portable, sleek vaporizer that allows for the use of both dry herbs and wax so that you are always able to vape what you want to vape while on the go. Storz and Bickel might as well be a household name with those who vape. This company created maybe the most popular vaporizer ever, the Volcano, and has since become the leading brand name for those who want a reliable desktop vaporizer. Storz and Bickel was also the very first company to ever make a vaporizer that was certified for medical use; this is due to the patented bag technology that they use that makes the vaporizers simple for the caretakers to fill and even easier for the patients to consume. Storz and Bickel not only created the Volcano Classic, but they began to change things up by creating quite a few other vaporizers on top of it. This company is known for the Volcano Digital as well. It essentially functions in the same way, bag and everything, as the Volcano Classic, but this vaporizer instead allows for total temperature control over the material that you are vaping. They are both the same in terms of functionality and in the way that they use convection heating exclusively. After the two desktop Volcanos came about, they began to introduce the Crafty and the Mighty. These are both handheld, portable vaporizers that deliver all of the same power as their volcanoes did but with portability involved. The Plenty was eventually added, which is a portable vaporizer that uses a hefty blend of both conduction and convection heating to give the most power possible to the unit and to provide even heating. Storz and Bickel is a go-to for many people who want to get the most out of their vaping experience, no matter if it is desktop or handheld. These dry herb vaporizers have quite the reputation and for good reason, making them a reliable choice that you will not regret. There are many ways to shop for a new vaporizer, but many people prefer to narrow their search to focus only on the vaporizers reviewed as the best by critics. VaporPlants makes it incredibly easy to narrow your search and focus only on the models offered by specific brands. By clicking on the images above you can see all of the latest desktop, portable, and vape pens from many different vape brands. Use the links now to see the latest designs from Grenco Science, Arizer, Magic Flight, the makers of the MFLB, or Stroz and Bickel, the makers of the Volcano. As more and more people are beginning to discover the benefits of quitting smoking and switching to a vaporizer. The manufacturer brands are responding by adding new products to their inventory to better meet the growing demand. This means that new vaporizer designs are hitting the market constantly, so fast that it can be difficult to keep track of all of the latest designs. That's why we put together our selection and categorized it for easy navigation and decision making: a collection of the latest vape pens and vaporizers that are being offered for vape enthusiasts to try. Whether you're looking for a vape for use at home, a dab pen to use on the go, you can always refine your search and see the newest products that will interest you the most.